Home > Retractable Awnings > The Retractable Roof Systems Are Business Friendly! If you are looking for a sturdy awning that offers you more control, then the retractable roof system is the perfect option. In a business sense, it is the ideal choice to maximise the value of your property. This innovative roof system comes in a variety of styles to match your business. 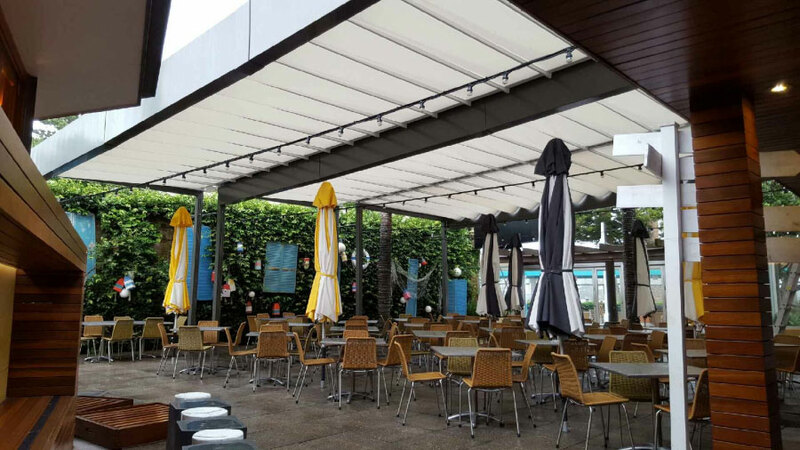 If your business needs a durable and ingenious awning design, then keep reading to know more about the retractable roof system. Installing the retractable roofs Sydney is a great way to expand your business without constructing a new building or a room. These roof systems not only make great first impressions but also increase the seating capabilities, especially if you are into the hotel industry. Many of your customers might like to dine outside, and if the patio is covered properly, you can attract more customers who would want to enjoy their food in an open space with fresh air rather than being in a closed environment. What Are The Advantages Of Using Retractable Roof Systems Sydney On Commercial Properties? When it is too hot, it affects the temperature of your building. The interior can become so hot that makes the air conditioning systems work over time. On the other hand, you might want to let the sun rays inside the building during the winter season so that you don’t have to make use of heating systems to heat the room. By choosing the small area in your property to install a retractable awning, you can save few bucks on the dreaded utility bills. For example, if you are into the hospitality industry, space is incredibly important. The more space you have, the more potential for business to flow through. Outdoor seating can be extremely valuable to your business depending on the weather condition. Even though the retractable roof systems in Sydney are mostly used for shading purpose, it can also be used for promoting your business. In today’s world, branding is essential for a company, and it is always smart to increase the visibility through all possible ways. By customising the retractable roofs with vibrant colour and attractive design that stands out, you can attract more customers to your business. The awnings can be customised to fit any space, all type of fabrics and you can select the colours based on your product or service. The retractable roofs in Sydney are the ultimate option for storefront, and there are so many colours and customised graphics to choose from. It can be manual or fully motorised, have all stainless steel fasteners and comes with a lifetime warranty. The retractable roof system uses an innovative fabric structure that will repel water. The ability to resist water is essential to protect your customers and maintain business during bad weather condition.